Appel Farm is the Proud Partner for Region 2 of New Jersey Poetry Out Loud! 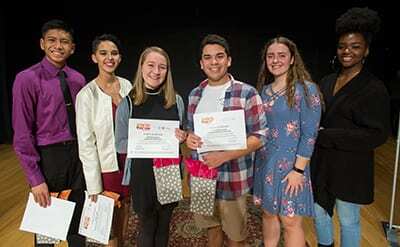 Poetry Out Loud is a free national program, sponsored by the National Endowment for the Arts and the Poetry Foundation, that encourages high school students across the country to learn about great works of classic and contemporary poetry through memorization and recitation. Not only do they share their interpretation and delivery of poetry; they also compete for awards and scholarships totaling $50,000. Poetry Out Loud is an incredible opportunity for students and schools alike. Registration is open for this year’s New Jersey Poetry Out Loud Program! A Teacher or administrator at a New Jersey public, charter, parochial school or home school organization serving grades 9-12, or the age/grade equivalent can register for the program. Registration closes Tuesday, November 20. Writers Theatre of NJ has partnered with the New Jersey State Council on the Arts for the past 13 years on the NJ Poetry Out Loud Program. Poetry Out Loud is a national poetry recitation program for all public, charter, parochial school and home school students grades 9-12, or the age/grade equivalent. Other grades are welcome to register and run the program at the school level, but do not qualify for the contest. 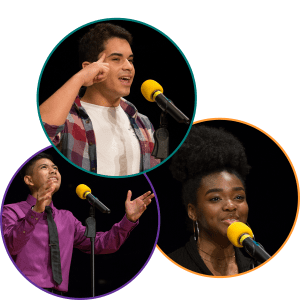 National Poetry Out Loud is a partnership of the National Endowment for the Arts, The Poetry Foundation, and the state arts agencies of the United States. Appel Farm is proud to host the New Jersey Region 2 Competition of Poetry Out Loud on Thursday, February 21, 2019 at 10:00 AM. The event is free and open to the public. Contestants will present their poetry in the intimate Clare Rostan Appel Theatre. We are pleased to be the New Jersey Poetry Out Loud Region 2 partner serving schools in Salem, Cumberland, Atlantic and Cape May counties. How does Poetry Out Loud work in New Jersey? Any teacher or administrator at a New Jersey public, charter, parochial school or home school organization serving grades 9-12, or the age/grade equivalent can register for the program. Registered schools must implement the NJPOL program between the months of September – early January in any classroom, club or after-school program. Book(s) of poetry from our partner, CavanKerry Press. School contests will have a minimum of two students, and contest judges. One winner per school will be recommended to attend the regional contest at Appel Farm as a Regional Contestant. Each Regional contestant must be prepared to recite a total of three fully memorized poems, reciting one poem per round. Poems must be from the approved POL Anthology and satisfy the contest criteria. For more information from Appel Farm on Poetry Out Loud please contact Tracy Power at [email protected], or contact Poetry Out Load directly at [email protected], or explore the links below.